Don't limit yourself to the default themes available in Google Presentations. Here's how to go beyond those defaults. 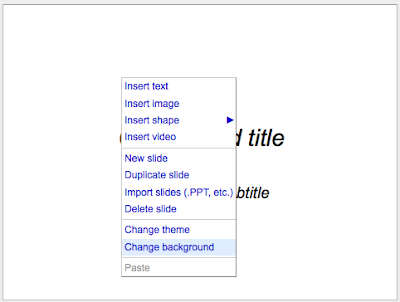 Google Presentations offers only a small set of predefined layouts for your presentation. But what if you want to do something unique, such as getting your company logo and background colors on every slide of the presentation? One way to do this is to right-click a blank part of any slide, and then select "Change background" from the context menu. A dialog like the one shown in Figure 4-1 will pop up. Click the "Insert image" link to upload an image or click the color bucket icon to pick a new background color. When done, check the "Apply background to all slides" checkbox, and click Save. Also, size your background image 640x480 px for best results!